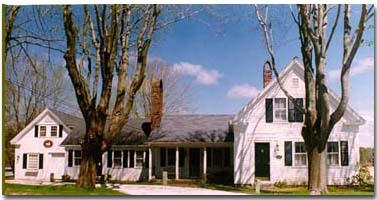 Welcome to the Wood Duck Inn, a circa 1848 home located in the rural seaside village of Cataumet. The Inn is nestled on a bluff with sweeping views of a 17 acre working cranberry bog and miles of conservation paths for you to enjoy. Cataumet is one of nine Bourne villages on upper Cape Cod and is a short drive to Falmouth, Island Ferries, the Cape Cod Canal, Seacrest Hotel/Conference Center, and sandy beaches. Privacy is emphasized at the WoodDuck Inn. Since there is no common area in the main house all rooms are fully appointed with comfort and privacy in mind, including private entrances, bathrooms, and sitting areas to enjoy the "continental plus" breakfast which is delivered to you each morning. The Inn has 2 suites and 1 room, all tastefully decorated with antiques and handmade quilts. Both suites offer magnificent views of the yard and bog. We are pleased to offer our guests the ultimate in privacy, including private entrances and baths, and breakfast delivered to you each morning. While the decor varies from rustic to romantic, all rooms are equipped with a flat-screen TV, refrigerator, coffee maker, and an iron and hairdryer for your convenience. We invite you to walk our grounds as well as the paths around the cranberry bogs. There are also many trails leading to peaceful settings such as Red Brook Pond and/or vigorous jogging paths. Most importantly, enjoy nature and the ever-changing views of the gardens and cranberry bogs at this unique and undisturbed spot. Whether your visit with us is for several days or for only one night, please let us know if there is anything else we may do to make your stay at The Wood Duck Inn a memorable one. The two neighboring Red Brook Harbor Marinas and the famous Chart Room Restaurant are within walking distance and Seacrest is only 4 miles from the Inn. We also have free Wi-Fi available.